The long title ought to be about as self-explanatory as need be. As a writer, this text had the weirdest history. It started out as a book, at an editor’s request, then I popped it up on the web page, as I fine-tuned the material. Finally, I published it. Quick, concise, down and dirty look at what signs get along with what signs. Includes a handy thumb-nail sketch for each sign — along with bait suggestions. It was written over a period of years, with thousands of charts used as archetypes and examples. No names, though. For sure. Tens of thousands of charts. The real title? 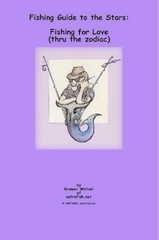 It should be something like “A Girl’s Guide to Bass Fishing, Boys and Boats.” Although, it might not be clear, it’s a guide on what combinations work best to land what (sign) of boy. Guy. Guide.